Since October of 2013, Titus Contracting has been working with Pepsi on this commercial retail remodeling project in Burnsville. After putting together a capital improvement budget and fine-tuning the scope of work, we were told at the end of last month that we were the selected contractor! Pepsi Midwest Bottling Plant vetted and trusted Titus Contracting of Burnsville, MN, to shape the commercial remodel project scope. The project developed from a full kitchen remodel with and possibly soaker tub upgrades to a bathroom, to including multiple additional side projects. The commercial remodeling work we will be doing for them includes completely redoing their executive offices: new doors, millwork, hardware, wall coverings, paint and carpet. We’ll be installing new flooring throughout all of the offices. 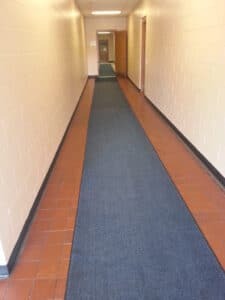 Shaw carpet tile seems to be our best bet for this because it allows us to keep the offices intact as we perform the replacement. Also, we will install Azrock vinyl composition tile (VCT) in areas where there is currently VCT. Not only that, we will be removing quarry tile, repairing the floor and re-leveling and re-coating the floor with Ardex. Ardex is a primer coating that will help create a consistent and smooth floor area where Pepsi performs its vending machine repairs. Ardex products are especially great because they don’t take as long to dry as other materials that are currently on the market. It should go without saying that we are really excited to be Pepsi Beverage Midwest’s contractor of choice, and we are really excited to get this commercial remodeling project started! We are always pleased when a company like Pepsi chooses us to be their commercial remodeling contractor, and we can’t wait to show them (and you!) the end result of our remodeling efforts. We know they will be pleased with what they see. When you find us to be a great commercial building contractor that is top notch and knows how to complete a quality remodeling project, who not ask us to do what needs doing? Pepsi chooses to; we welcome the privilege. So when you are looking into getting a commercial remodeling project underway, call Titus Contracting at 952-746-7817 or contact us online for a Free Estimate. One of our knowledgeable representatives will be in touch with you ASAP to talk about your commercial remodeling project!